Well before donning my riding shoes for the Pan-Mass Challenge bike-a-thon, I had anticipated being wowed by a spirit of goodwill. But setting out to ride for the first time in the country’s most successful sports philanthropy event, I could not have estimated how much participants from every angle would lift each other in support of cancer research. Experiencing the event firsthand and writing its story in my new book, Closer by the Mile: the Story of the Country’s Most Successful Athletic Fundraiser, brought fresh insights into what makes charitable giving resonate deeply with so many of us. Taking individual action is certainly vital. But what feels even better is joining a cause, a collective that makes such a profound difference in people’s lives. In this case, fundraising for Boston’s Dana-Farber Cancer Institute helps to sustain patient care and promising yet so-called fringe research that the center otherwise could not afford. Everyone showing up at the Pan-Mass Challenge finds this mission reinforced by many others who have their own connections to loved ones and disease. There is a compelling unity and an ethos that reinvigorates itself each year on main streets and back roads. 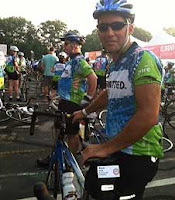 Ken Brack participates in the 2012 Pan-Mass Challenge. Both as a rider in 2012 and as an observer the previous year, I also felt a quality of reciprocal giving that exceeds typical expectations of charity participation. During PMC weekend, as the event in early August is known, and throughout months of preparations, people from all walks of life inspire each other to reach extraordinary levels. Together they replenish the cause: whether patients or cancer survivors, volunteers acting in remembrance or friendship, wanna-be weekend warriors, or kids handing out drinks at rest stops. There are also some riders and donors who earmark their contributions to specific types of research, playing an even more direct role in forging of new cures. How does the PMC and its network of thousands of donors accomplish this? I found that while some of it has to do with a largely affluent, professional demographic there’s something else at work here: riders’ creativity in fundraising and their commitment to the cause. Cancer strikes so many of us, and the PMC’s reputation as an iconic event continues to grow both in and outside of New England. Yet perhaps there are broader trends going on as well. Paul Schervish, a sociology professor at Boston College, has a way of describing this willingness of donors and participants to shape outcomes, rather than just reacting to society’s needs. Schervish calls it the reach of one’s “moral biography.” He writes that many of today’s most generous philanthropists combine a “personal capacity and moral compass.” They move from aspiring to create change to closing the gaps as change agents themselves. Going further, Schervish, who directs the Center on Wealth and Philanthropy at BC, finds that some of us move into “hyperagency.” By that, he means an “institutional-building capacity” among people who are capable at times of forming solutions – like funding research in an era of research funding cutbacks. I contend this spirit is alive at events like the PMC. Not just in the executive class or among faculty at the esteemed teaching hospitals as in Boston. It also shines among carpet cleaners and bookkeepers, struggling college grads, clerks and teachers, who also are PMC riders. Shortly before kicking off on our inaugural ride last summer, my wife and I chatted with a woman in her mid-50s. We shared a quick makeshift breakfast inside a tent at one of the starting hubs. Our adrenaline was already beginning to spike. We, too, were about to do something. 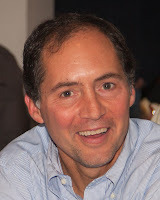 Ken Brack is a nonfiction author and journalist who lives in southeastern Massachusetts. His debut, Closer By The Mile, is being published this month. Brack rode his first Pan-Mass Challenge in 2012 in memory of his mother, who died of ovarian cancer in 1999. His forthcoming book, Unspeakable Gifts, conveys the experiences of people climbing from catastrophic loss who transform their lives to inspire others.